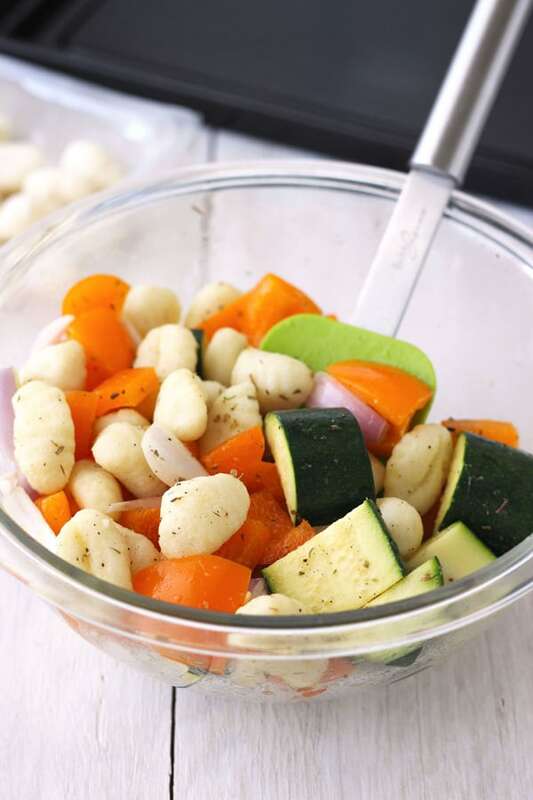 One pan roasted gnocchi and vegetables is an easy weeknight dinner for two that comes together in a snap. There’s no special bakeware required, just the pan that came with your toaster oven. And make sure to check out the veggie-swapping tips…asparagus tastes fantastic! In our house, weeknights are not for trying new recipes. I save those kinds of risky gambles for the weekend. The few times I’ve attempted to change up our weeknight salad or toaster oven baked potato routine with some new and exciting recipe it’s always ended the same. Me: elbows deep in dirty dishes at 10 pm. Sweet but very hungry hubby: snacking on a box of peanut butter Puffins. Well, that all changed when I stumbled across a genius sheet pan dinner on The Kitchn’s website that called for shelf-stable gnocchi (already in the pantry! ), a few herbs and fresh veggies. It was such a neat and simple idea, I was ready to roll the dice and try it that night…a weeknight. The recipe was too big. Just like the recipe that inspired this tasty lemon blackberry baked pancake, and pretty much ALL the good recipes in this “Big Oven” world we live in, it needed a few adjustments to be toaster oven-friendly. After reducing, swapping out and eliminating some of the ingredients, taking the temperature down a bit and skipping the parchment paper (since that’s something you shouldn’t put in a toaster oven) I was finally in business. And let me tell you, it was so worth the effort. 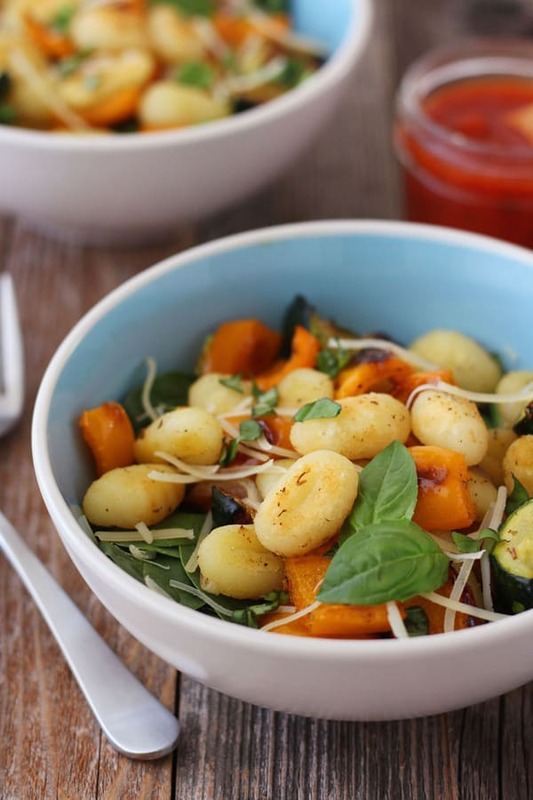 What Does Roasted Gnocchi Taste Like? Having never roasted gnocchi before I wasn’t sure what to expect but the crispy outside-chewy inside texture was a fun surprise. I can imagine making a whole pan of just crispy gnocchi to chow down on while watching the Big Game. Maybe drizzling buffalo sauce over the pan and serving it with the blue cheese dip from these buffalo broccoli cauliflower bites. 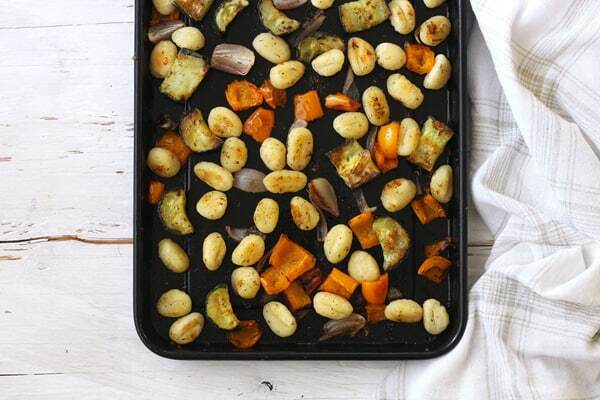 It’s not just about the gnocchi though, the roasted vegetables are delicious too! We like using an orange or red bell pepper with zucchini and a few shallots. Shallots are the best when you’re only cooking for two – no leftover onion to use up! But I’ve made this recipe a bunch in the last few weeks and it’s super flexible. Asparagus or sliced cremini mushrooms are fun, just add them halfway through the cooking time since they don’t need as long in the toaster oven. Broccoli, cauliflower and Brussels sprouts work too but only if you cut them into smaller pieces. Half a seeded and chopped delicata squash tastes great though I’d avoid harder squashes like butternut or acorn, they won’t cook fast enough. To help balance out that heavy feeling that sometimes accompanies a belly full of gnocchi I like to serve ours with a few handfuls of fresh baby spinach. The mix of roasted and fresh vegetables adds a nice blend of different textures too. Lastly, to really deliver a strong pasta-vibe add marinara sauce (a few spoonfuls of ricotta if you’re feeling indulgent), fresh basil and a sprinkle of parmesan cheese. 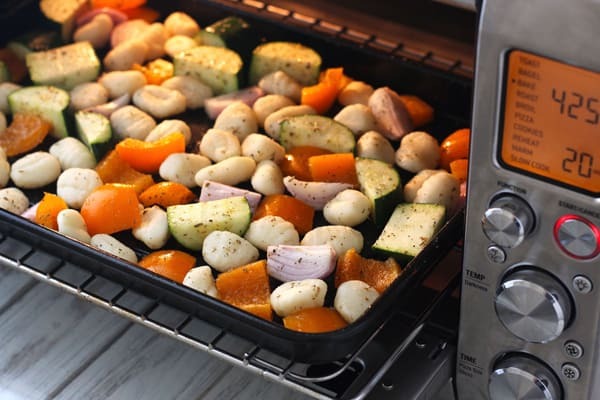 I hope this one pan roasted gnocchi and vegetables is a weeknight hit in your toaster oven lovin’ household too. « Ask the Readers: Where can I find toaster oven bakeware with lids? 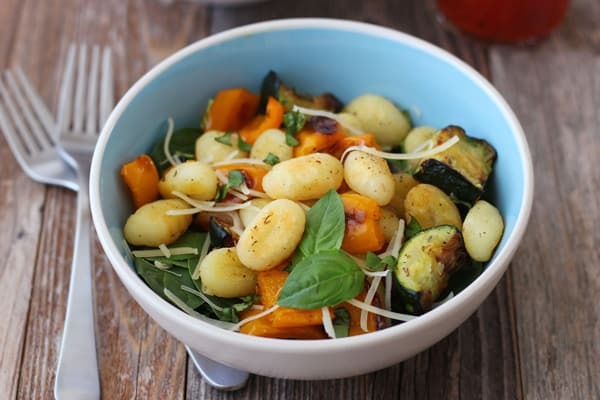 I have never even imagine that gnocchi could be roasted! This sounds like a recipe I would love to try.